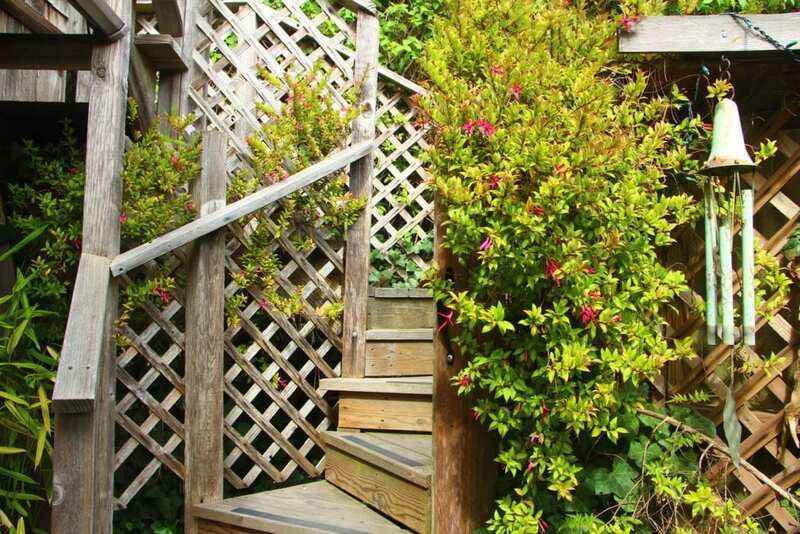 The secluded views of the ocean and private path to the beach at Alegria Oceanfront Inn & Cottages may be one of Mendocino Village’s best kept secrets. 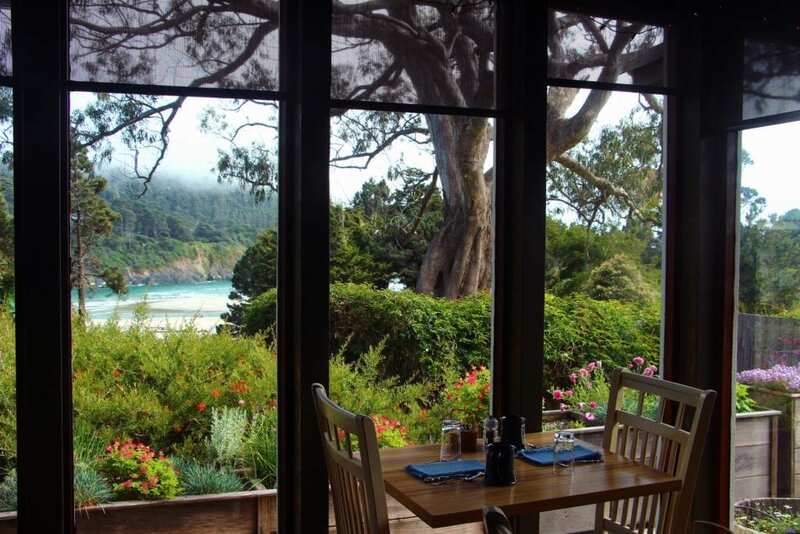 As the only ocean-side bed and breakfast in the village, you can sip locally-roasted organic coffee over a delicious breakfast and enjoy views of the frothy surf converging at the mouth of Big River. The water here takes on a vivid aquamarine color, even on days when gauzy swaths of fog drift along the headlands. 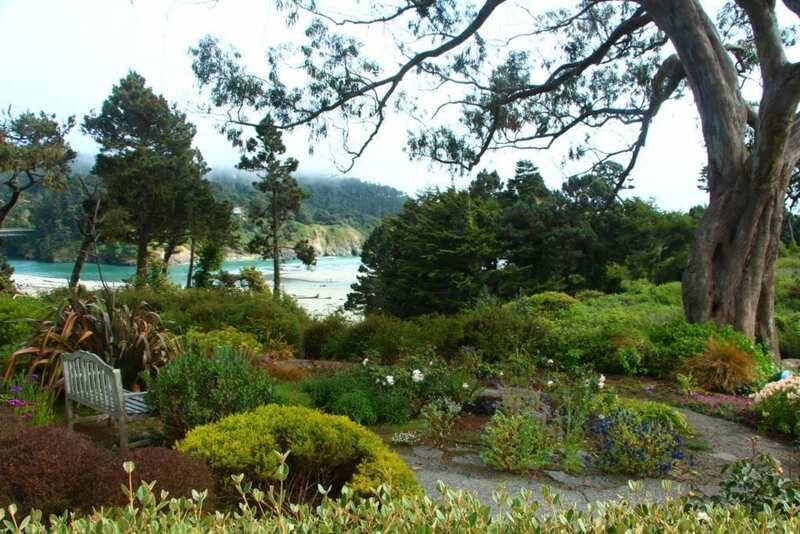 From Alegria’s beautiful gardens beneath a sprawling eucalyptus, a private trail winds its way down to a wide, driftwood-strewn beach. 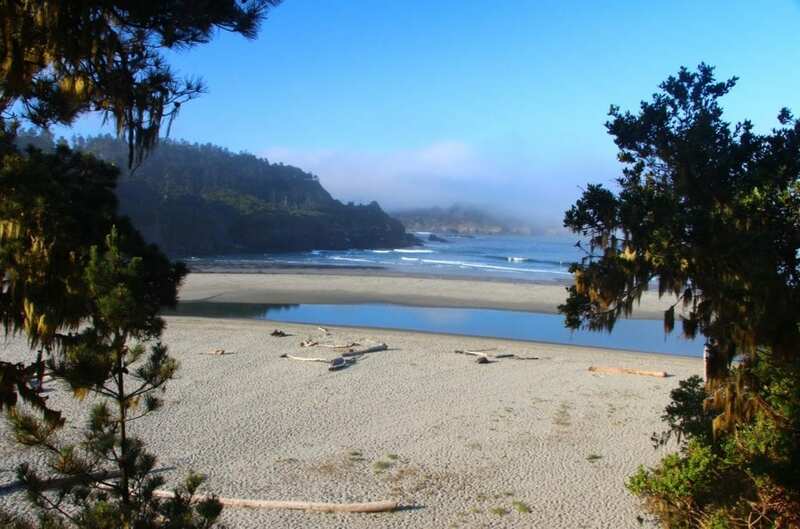 The beach has hidden coves and trailhead stairs to Mendocino Headlands State Park’s footpath, which skirts the edge of the ocean bluffs. Alegria’s garden hot tub also provides a relaxing view of the waves. 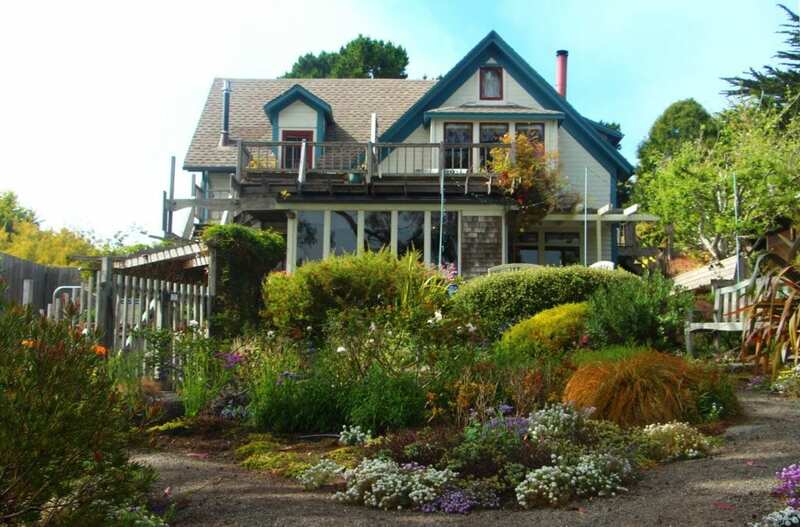 The unassuming inn is tucked into a quiet corner of the village, yet is still within walking distance of Mendocino’s best restaurants, shops, and galleries. As tempting as the menus were for some of the restaurants, I had taken a long hike along Big River and the headlands earlier in the day. I craved something simpler. My room had a well-equipped kitchenette with a set of plates, glasses, utensils, and a wine opener. The fireplace was carefully stacked with logs, kindling, and crumpled newspaper, just begging to be lit. Outside, the skies were temperamental: alternating between shrouds of fog and dazzling sunbreaks. I opted to forgo the fancy dinner and enjoy a quiet evening at the inn. I walked to the local market to pick up a bottle of wine and a couple of items from the deli, and then headed back to my room. I lit the fire, which turned into a crackling blaze within minutes. I popped open the wine, dished up my improvised dinner, and slipped outside to the private deck, where I could watch both the fire and sky. As daylight faded, the fog swept over the sea and the village, softening the edges of the Victorian rooflines and making silhouettes of the cypress and pines. Alegria is comprised of two, spacious, oceanfront guest rooms in the historic main house and four unique cottages with an eclectic, bohemian vibe. The main house was built in 1861 as a private home to successive generations of sea captains and their families. The cottages were built by local artisans and craftsmen in the 1970s as the property was transformed from a private residence into an inn. The cottage closest to the water, Cove Cottage, has oceanfront views and Asian accents with rice-paper screens and bamboo floors. 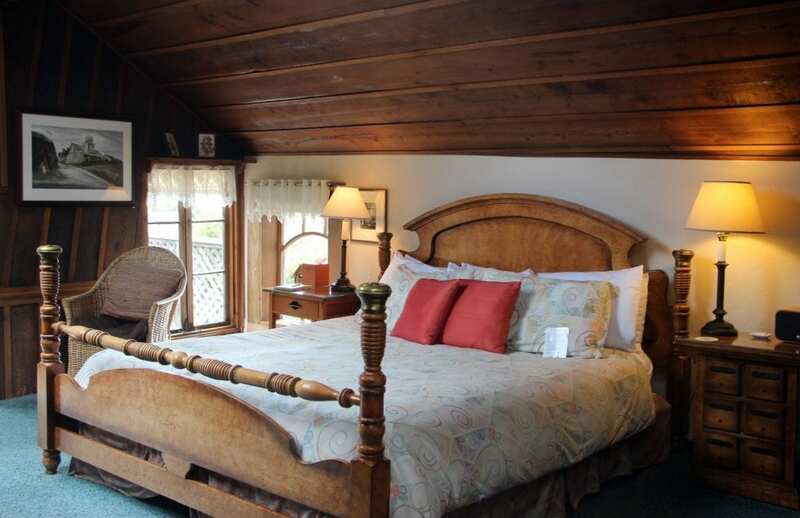 Driftwood Cottage is a free-spirited A-frame cottage with a sleeping loft, Japanese soaking tub, and mosaic artwork. The cottage I stayed in, the Treehouse, is perched on the upper floor of the former carriage house, up a narrow, twisting set of stairs. It has a rustic appeal with a weathered wood-shingled exterior, vaulted ceilings with redwood paneling, and two large skylights for gazing up at the trees and the stars. The room’s kitchenette is well-equipped with a small refrigerator, microwave, electric tea kettle, coffeemaker, freshly-ground local organic coffee, and an assortment of teas. The room also has a TV with a DVD player and an iPod docking station. The king-size bed was extraordinarily comfortable. Propped up on pillows next to the fire, I stayed up writing on my laptop until late at night. 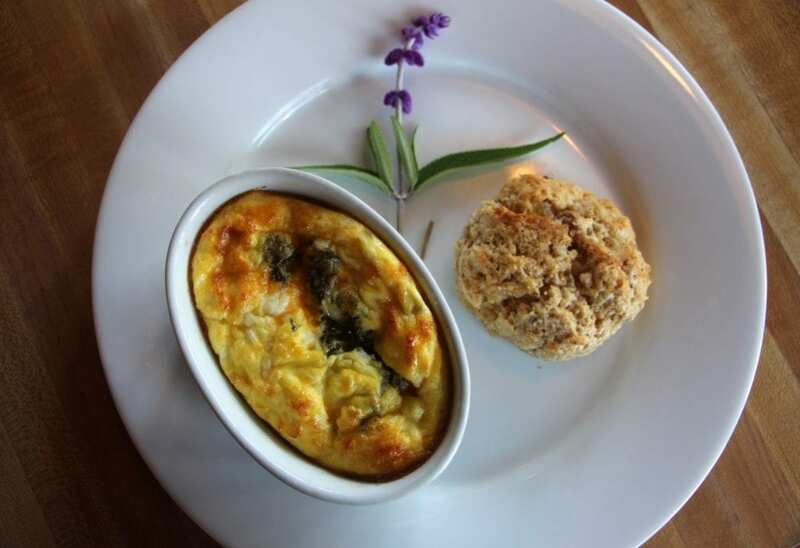 In the morning, Elaine Wing-Hillesland was busy preparing breakfast in the kitchen (a divine baked eggs with pesto served with fruit and a warm apple pecan ginger scone), while her husband, Eric Hillesland, bustled between tables in the dining room, serving drinks and first courses. The guests were gently cajoling Eric into telling the story of how he and Elaine came to own the inn. I sensed it was a story Eric never tired of telling. Elaine smiled while she worked her magic in the kitchen. 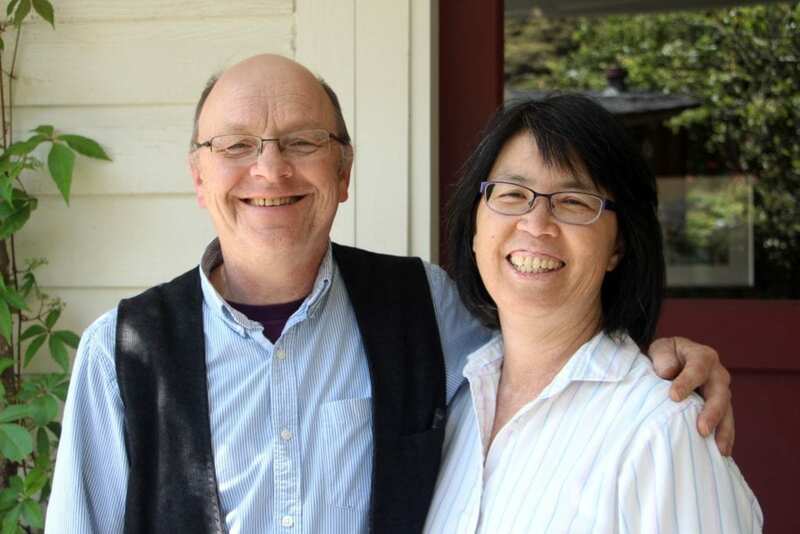 Eric and Elaine first visited the Mendocino coast 32 years ago on their honeymoon, and they had been coming back for their anniversary every year since. 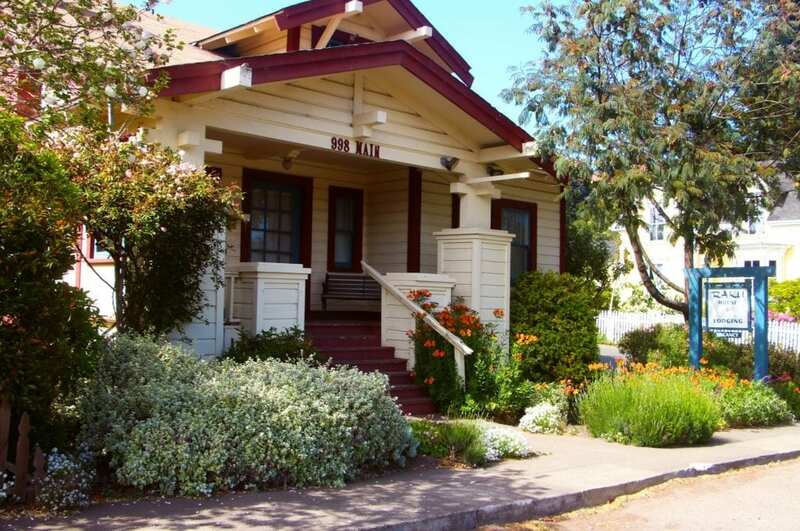 They lived in Martinez, where Eric worked as an engineer and Elaine worked in architecture. But they wanted to figure out a way to live on the coast and combine their professions. Innkeeping appealed to them because it was something they could do together and share in raising their infant daughter. When they began looking for an inn, having a location right on the water was most important to them. They wanted to share their affinity for the coast with their guests. After a few initial disappointments in their search, they found the Alegria with its stunning oceanfront setting. They closed escrow in August of 1998, just a day after their 15th wedding anniversary. In the 17 years since Eric and Elaine have been hosting guests at the Alegria, they’ve built a loyal and ever-growing fan base with their unobtrusive, down-to-earth brand of hospitality. They’ve also expanded their lodging offerings. 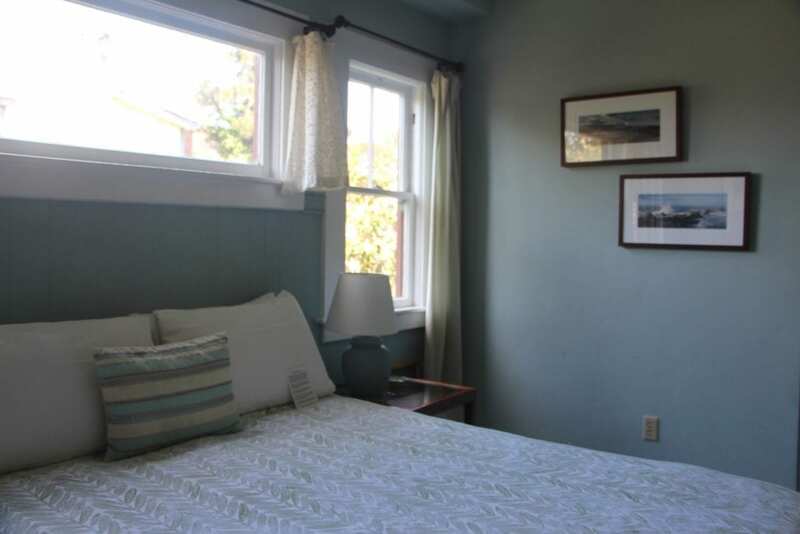 The Raku House across the street offers four quiet guest rooms in a Craftsman-style home with access to Alegria’s beach path and legendary lemon bars. 17 years also marks a personal turning point for the Hilleslands. The couple’s daughter, for whom they changed careers so they could share in raising her, was just a year old when they bought the inn. She graduated from high school this past June and will be heading to Cal Poly in the fall.